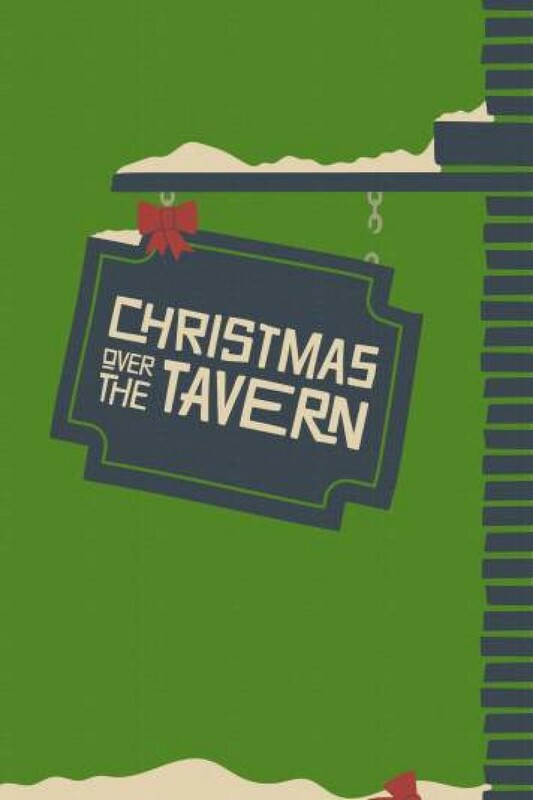 MusicalFare Theatre has a hit on its hands, or more aptly boards, with the world premiere of Christmas Over the Tavern by Buffalo native Tom Dudzick. We Buffalonians love plays about ourselves, particularly ones that speak to our particular and sometimes peculiar ways. So a first ever musical by Mr. Dudzick, who wrote the acclaimed Over the Tavern series, is just the ticket for theatergoers this holiday season. But if you do not already have a ticket, you are out of luck. The entire run is sold out. Take that Hamilton! Mr. Dudzick has captured a time and place in our history with warmth and wit, blending the comic and the tragic, while he pulls no punches about patriarchal and parochial dominance in the lives of the Catholic working class in the 1950s, and the often-negative effects that dominance had on the spirits and creative drive of those impacted. (Well, he did pull a few punches at the end, but only in the spirit of leaving the audience with a Merry Christmas.) 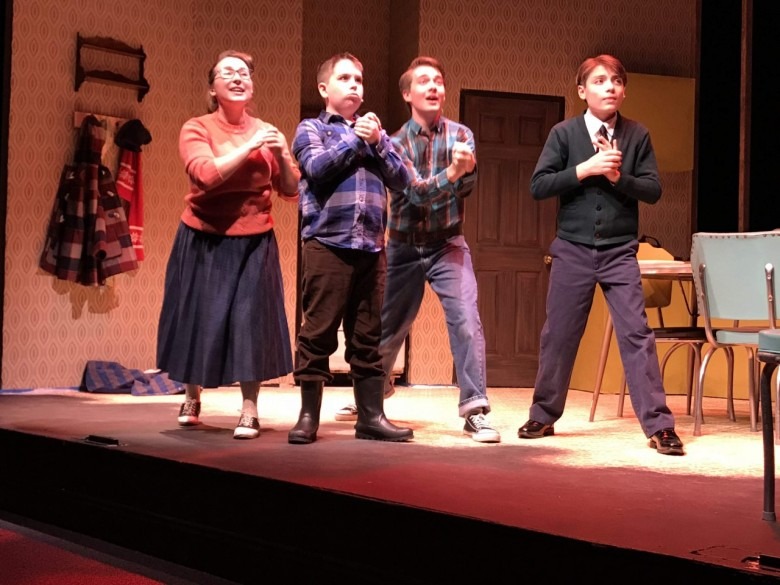 His musical is a time capsule that underscores the trials, tribulations and joys of such families in the Pazinskis, a working-class Catholic family living above their tavern on Seneca Street. The book is chock-full of local references, culinary preferences, and shared cultural experiences. Buying a Christmas tree? Head over to the Clinton/Bailey Market. Packing a school lunch? Mmm, bologna sandwiches and Hostess cupcakes are delish. What about that black and white phenomenon, TV? It presents the Pazinski kids with happy sappy families on shows like Father Knows Best and Leave it to Beaver that have them lamenting their own fractured family in the song Why Can’t It Be Like on TV? Their dad is bah-humbugging everyone’s holiday enthusiasm and Mom and Dad are fighting all the time. Son Rudy, the 7th grade comedian who questions why Jesus is so touchy, is in danger of being expelled from St. Casimir’s by Sister Clarissa for blasphemy because of his unique comic take on the Nativity story. Not like TV at all. Sister Clarissa is the Every-Nun of the '50s in her black and white habit, brandishing her clicker and ruler to subdue impure or blasphemous thoughts or actions by her charges. She is depicted with dead-on accuracy—and utter hilarity—by Pamela Rose Mangus. In twelve years of Catholic school, I encountered many a nun with that same single-minded determination that Ms. Mangus has perfected. However, she is a great deal funnier than any of the ladies of the church I ever met, as she takes the humor in the pain to a high art. The kids in the show are all very professional. Eighth grader Michael Scime as the incorrigibly comic Rudy does wonderful imitations of people dead long before he was born. His Ed Sullivan is terrific, as are his Three Stooges, among others. He has a lot to do in this show and does it all very well. Isaac Fesmire is Georgie, the mentally challenged boy of few words. He is delightful in his number with Santa. Caroline Schettler is Annie, the older sister to the crew. Samuel Fesmire is Eddie, the oldest son. Both are excellent as teenagers dealing with the rift in their family and the angst of adolescence. The three siblings show their stuff when they sing Santa Claus Is Comin’ To Seneca Street to Georgie. Jacob Albarella is Chet (and others not to be named here), the father whose depression and anger are hurting his business and his family. He sings the comic If I Hear One More Christmas Song with an underlying anger that becomes more pronounced as the show progresses. He is completely believable as the frustrated blue-collar tavern owner and failed ball player who has distanced himself from his children and his wife Ellen, played by Wendy Hall. She is very good as the '50s Mom who just wants her family to be happy and her husband back the way he used to be, as she laments in her song, I Want My Guy Back for Christmas. The set, designed by Dyan Burlingame, works very well with a silhouette of the Buffalo skyline in the background of the very '50s kitchen with a formica table and vinyl chairs on one side of the stage, and a turntable that becomes the bar and a boys’ bedroom among other places on the other side. Direction of this two-hour musical is by MusicalFare Artistic/Executive Director Randall Kramer. Choreography is by John Fredo, who keeps it simple and charming. While this is a Buffalo-themed show, like the Over the Tavern series, it speaks to a wider audience in its depiction of family struggles and religious zealotry. It is also a great deal of fun and a blast from the past for those of us who grew up Catholic and working class in the 1950s. I attended the show with a friend who sat in front of me in classes (“Sit in alphabetical order, girls!”) for four years in high school. We had a great time at the show and afterward talking about the old days and being very glad they are over with and we and the world have moved on.